By taking the Unity VR Developer Course you're going to be able to make your own room-scale or seated VR games with Unity and get them ready for distribution on the app stores or find a job as a VR developer. After taking the course you're going to be in a prime position to take advantage of the rapidly accelerating growth of VR and get your content out into the hands of users. By following along in this project-based course you're going to get a useful, practical, finished result - a Zombie Shooter game! This course is also well organized topically, so you'll be able to refer back to the lectures and easily find help on a particular topic. 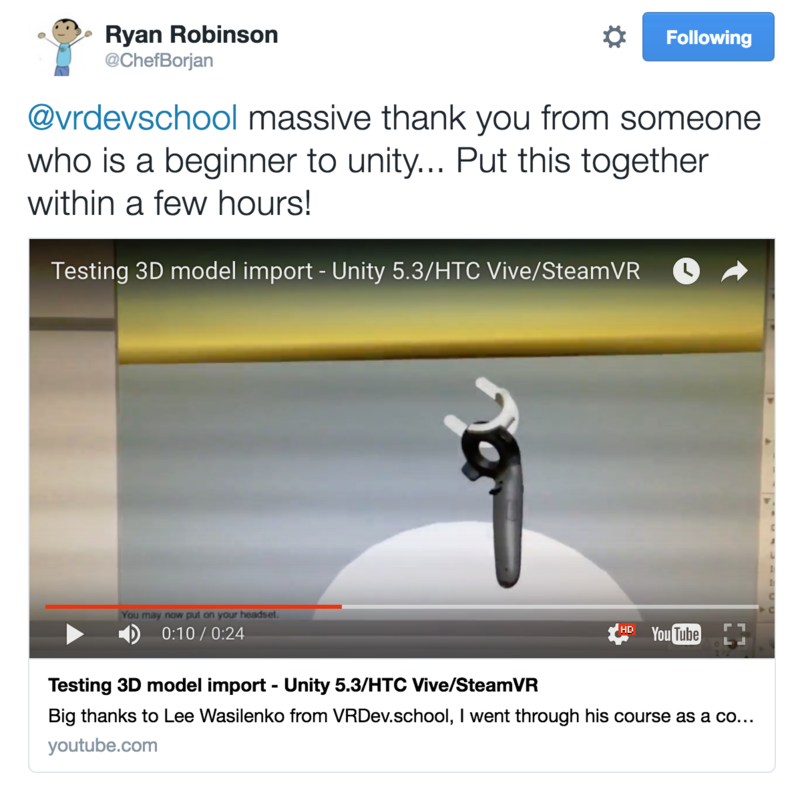 In addition to lifetime access to the course content, by enrolling in the Unity VR Developer Course you will receive exclusive access to the VR Dev School Slack Group. This is group is made up of hundreds of serious VR developers who want to help each other and share their tips, tricks and struggles. VR is going to have an impact on many industries including entertainment, healthcare, education and technology. While the focus of this course is currently on making games, the application of the skills you will learn extend and translate far beyond that. 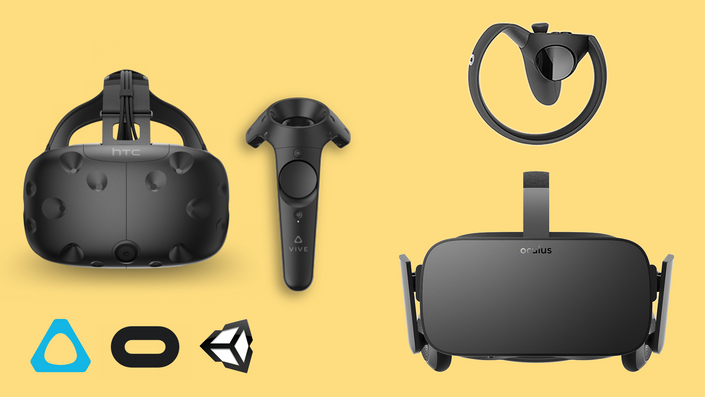 3D engines like Unity are becoming the work horses of the VR economy so after taking this course you're going to be fully prepared to tackle new challenges in VR application design and content creation. What you do with that powerful knowledge and how you contribute to the VR ecosystem is up to you and your imagination. VR is the most compelling medium ever invented. Hardware costs are dropping and this new medium is already exploding into the mainstream. Don't miss out on what is projected to be a $70B industry by 2020. Get started creating your apps, games and experiences right now. Normally, in-person live training courses for Unity and VR costs $10,000 (this is the price of an 8 week course in San Francisco). And any online course for a small market of cutting-edge tech early adopters would normally cost at least $900. Heck, even a ticket to a conference with a couple of short workshops is around $500! That's simply the price you pay to get early access to what will be an exponentially growing market. We want to help grow the VR developer community and enable more developers to get involved so we're not going to ask you to pay another $900 after you just bought a Vive or a Rift and a new GTX 970 or better GPU. This course currently offers more than 50 lectures and 9 hours of content and we're planning at least another 25 lectures and 3 hours of content before we consider it finished. By enrolling below you will get lifetime access to the course, all the course updates and a private Slack group invite for only $297! Make a one-time payment of $297 USD and get lifetime access to the course and all future updates. Recommended option. This is the best and cheapest way to gain immediate, lifetime access to the course. I recognize that some VR Dev School students have just spent a great deal of money building a VR ready PC and buying an expensive VR headset or are college students with a limited monthly income. So to ease the financial burden VR has been putting on your wallet I have added a payment plan option to the course. Please note that you will lose access to the course immediately and automatically if you cancel a payment or if your payment fails. Also note that you will not be offered a refund on these payments. We've worked hard on this course and are confident you're going to love it. We want it to be a no-risk purchase, so if you've selected the One-time Payment for Lifetime Access option and are unsatisfied with the course, contact us in the first 30 days and we will give you a full refund. See the FAQ for details and restrictions. We offer a Risk Free Guarantee so if you are unsatisfied with your purchase contact us in the first 30 days and we will give you a full refund. Unfortunately due to technical restrictions with our payments provider this guarantee does not apply to the Monthly Payment Plan option. See the text on that plan for more details. Do I need a Vive or an Oculus to take this course? You can certainly do a lot of the course without having an Vive or Rift in your hands yet and with the updates coming in Unity 2017.2 you will be able to do even more. But of course, to test the code (especially where controller input is required) you will need to have the hardware. We recommend having access to a Vive or Oculus Rift to get the most out of this course. When will all of the content for this course be completed? We want to be very clear that not all of the scheduled content for this course is available yet. There is over 9 hours of content already in the course so far, but there are a few sections we are still working on. We plan to have those sections completed by Spring 2018 and will then circle back and update some of the older lectures. If for any reason in the next 30 days you decide that this course is not for you there is a no-questions-asked refund policy. From the free mini-courses you already know the quality of the content Lee has put out is high and combined with the refund policy this is a no risk purchase. The 9 hours of content already in the course more than justifies the cost and the upcoming content will enhance the value of your enrollment. Do I need experience with Unity and C# or 3D graphics before taking this course? Since there is a dire need for VR specific Unity training and a huge wealth of Unity basics material out there, we expect at least a little familiarity with Unity and with an Object Oriented programming language. That said, when concepts you should know arise, Lee will briefly review them and will point you at the relevant Unity docs page in the lecture notes in case you need to pause and brush up. We've designed the course so that if you have completed some of the official Unity tutorials you'll be just fine in this course.